Pakistan can only begin the journey back from the abyss when its leaders have the courage to deal with religious intolerance. IN the short space of a few months, two brave men – one a Muslim, the other a Christian – have been assassinated in Pakistan. Both died at the hands of religious fanatics. I never had the privilege of meeting Governor Salman Taseer who was assassinated earlier this year but I counted Shahbaz Bhatti, the Federal Minister for Minority Affairs who was gunned down in Islamabad two weeks, as a friend. I first met Minister Bhatti in Berlin last year and then again at a meeting in Ottawa a few weeks ago. We sat in a hotel lobby and talked late into the night. He shared his hopes and fears for the future of his nation and his struggle for justice for Pakistan’s embattled minorities. He was an incredibly courageous and inspiring leader. Despite the many death threats he had received, his request for better protection fell on deaf ears. Nevertheless, he was passionate about his calling and determined to stand up to the forces of extremism. Like Taseer, Bhatti campaigned for the reform of Pakistan’s notorious blasphemy laws which have consistently been used to harass and intimidate the country’s minorities. The very charge of blasphemy, often by people with an axe to grind, was enough to touch off mob violence against Christians and others. People charged with blasphemy have been hunted down and killed even when the courts had set them free. A Christian woman, Aasiya Bibi, a mother of five, is currently facing the death sentence for blasphemy. Both Taseer and Bhatti believed she was innocent and campaigned actively for her release. It ultimately led to their deaths. Pakistan has been in a long, slow, downward spiral. Communal and religious violence is now so prevalent that many consider the country a failed state. It might be tempting to blame Pakistan’s dismal state of affairs on external factors but the real reason is the failure of its leaders to cherish and defend the founding ideals of their nation. Mohammed Ali Jinnah, Pakistan’s founding father, had envisaged a nation premised upon the principles of freedom and democracy. Tragically, Jinnah’s successors have had neither conviction nor courage. They prevaricated and compromised; they hedged their bets and sat on the fence when extremism and intolerance reared its ugly head. And what’s more, they manipulated and exploited the worst instincts of their countrymen in their quest for power. They nurtured the seeds of intolerance and division, and now it has come home to roost. It says a lot about the sorry state of Pakistani society when more than 500 clerics signed a statement praising Taseer’s killer as “a true soldier of Islam” and lawyers showered him with rose petals when he appeared in court. What hope is there for a country when cold-blooded killers are hailed as heroes? 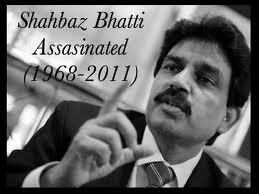 Following Bhatti’s assassination, Pakistan’s political elite delivered the usual eulogies mourning his passing. They promised, with just the right balance of indignation and solemnity, to bring his killers to justice. Three days of national mourning was declared. Parliament observed a few minutes of silence and members even staged a symbolic walkout to protest his murder. What a bucketful of empty and meaningless gestures! If they really want to honour men like Taseer and Bhatti they should summon the courage to immediately amend the notorious blasphemy laws or better still, abolish them completely. They have no place in a modern state and are inconsistent with Pakistan’s founding principles. It is also the only appropriate response to the senseless killing of these brave and honourable men. When Pakistan’s leaders find the courage to do that and to face down the men who preach and promote religious intolerance and violence, Pakistan will begin the journey back from the abyss. What is happening in Pakistan is instructive to us in Malaysia as well. The road to perdition is usually a slow one marked by many missed opportunities to confront intolerance and injustice. Most Malaysians agree that a culture of intolerance has been slowly building in Malaysia. However, instead of staring down the extremists in our midst, we give them both place and space to grow. It dignifies discrimination and makes intolerance respectable. Prime Minister Datuk Seri Najib Tun Razak has called for a coalition of moderates to confront extremism. It has never been more needed. Let us start at home and be the change we want to see elsewhere. If Najib succeeds, and we all pray he will, it would undoubtedly be his greatest legacy to our nation. It will also make us that “beacon of light in a disturbed and distracted world”, to quote from Tunku Abdul Rahman’s Merdeka speech.